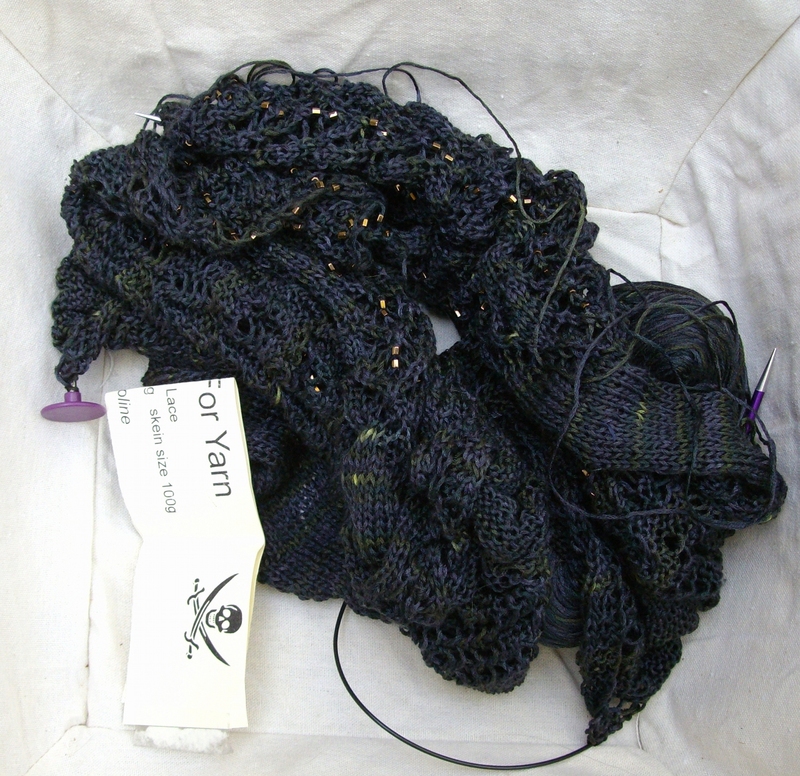 This is almost a Moonstruck jacket, because I had almost enough yarn. See that squiggle of yarn at the bottom there? That’s how much yarn I have left. Not enough. 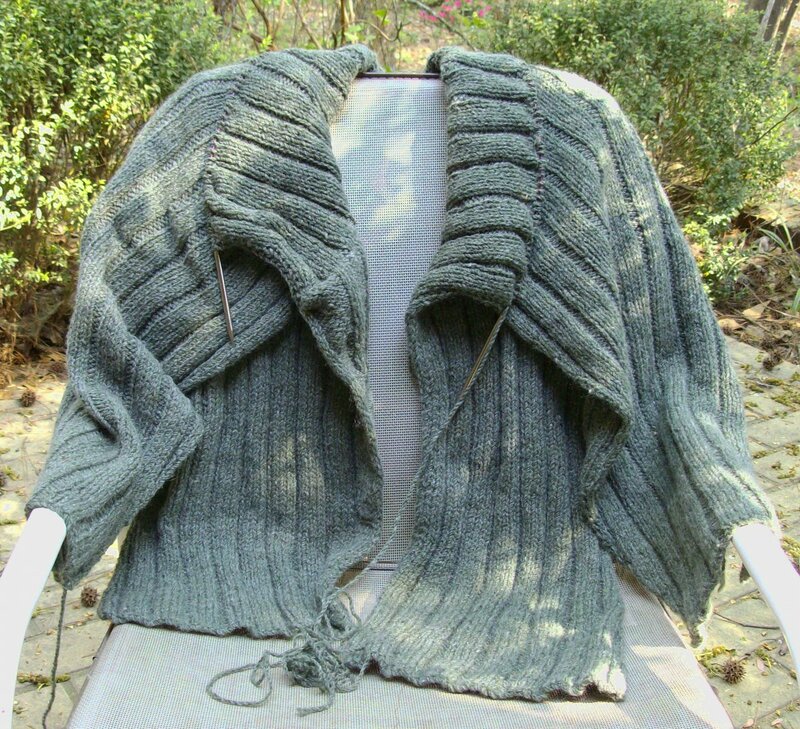 I could make the collar shorter, but the collar’s kind of the point of the thing, and making it short enough to leave enough yarn for seaming would mean a less dramatic look. A collar of ‘meh.’ Luckily, Beaverslide has more of the same dyelot. However, I want to make a colourwork cushion from their sport weight, and I might as well order all that yarn at once, and that can’t happen until…well, you see where this is going. Since winter is very much over in these parts, there’s no rush, I guess, but it nags at me. Almost the second of a pair of Stepping Stones. 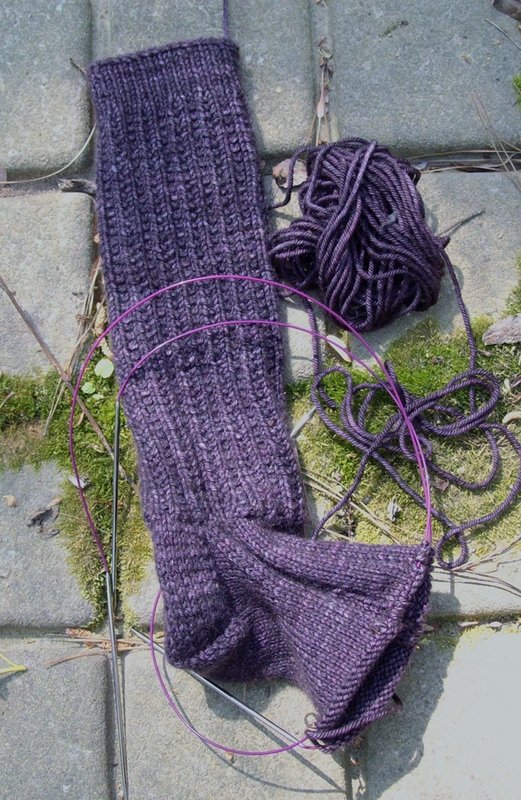 It’s a bit warm now for worsted weight merino/cashmere/nylon socks, so I’m having some trouble getting motivated. These will probably get done soon, though, since there’s nothing preventing it except my project-related ennui. This one’s a bit ridiculous, as I started it last fall, and it’s satisfying to work on, and doesn’t really take that long to make, but then life got in the way. However, it really is almost ready for testing: 7 more pattern repeats, some finishing, and a couple of photos, and I can get this baby out to my beloved pattern testers. Hopefully this week. God willing and the creek don’t rise. And of course there’s my work room. For the life of me, I cannot get a decent, clear photo of it, but trust me: it’s almost there. I ended up going with Option 1, managed to steam clean most of the cat pee smell out of the carpet (don’t ask), and have set up a knitting chair, a couple of tables, my spinning wheel, and a desk. I’ve even hung up some art. It’s a lovely room (apart from the ghosts of incontinent felines past), and I work in it daily, but it won’t feel finished until it has yarn storage and some kind of bulletin board-type-thingy with calendars and such so I can see at a glance where things are at and where they’re going. It’s very close, though, and I’m pretty happy with it. Even this blog post sat half-finished for a week, for crying out loud. However, I’ve finished the post, which bodes well for the rest of the almost-there. Because almost a sock still isn’t a sock, now, is it? I vote that you finish that jacket while you can still get the same dye lot–you never know when you might travel to a slightly cooler place. It will be spectacular! You’re probably right. I have some really beautiful buttons for it, too. Sigh. Yeah, I’ll probably break down and order the one skein. Doooo eet! You will feel GOOD. Good to know I’m not the only one who can’t finish my knittong projects! So many WIPs, so little focus….